Unistats and KIS – just too much information? 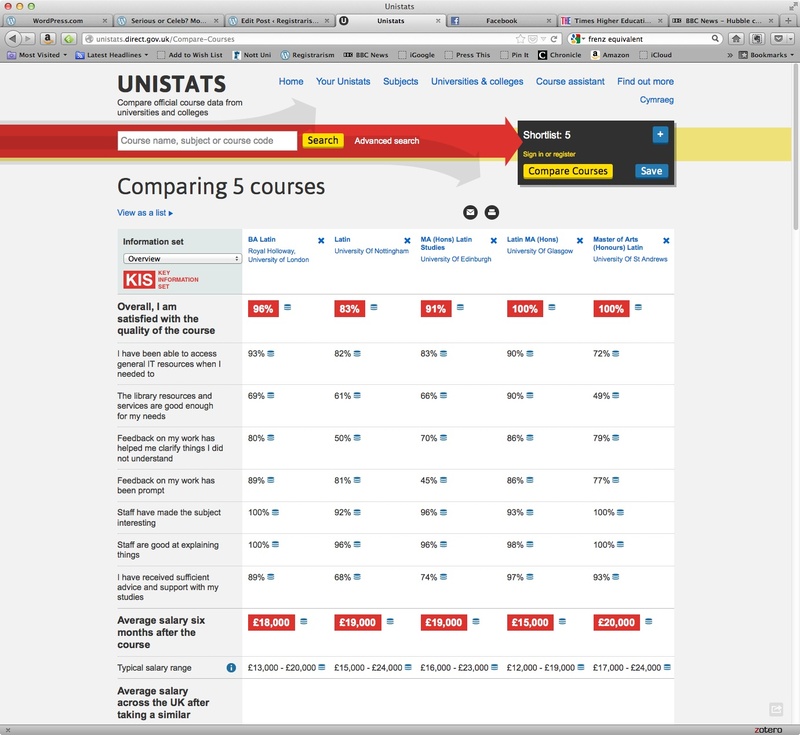 Unistats is the official site that allows you to search for and compare data and information on university and college courses from across the UK. The site draws together comparable information on those areas that students have identified as important in making decisions about what and where to study. The items that students thought were most useful have been included in a Key Information Set (KIS), which can be found on the Overview tab for each course. However, we do have a problem. As previous posts have noted there really is just too much data here and across the various university, HE sector information and league table websites. The launch recently of the new Which? University site (about which I posted here recently) added to the mess and the Unistats upgrade just serves to make the picture even more complicated for applicants. There is no information deficit in HE. We do not need more and better course comparison websites. What we do need is fewer new websites and more and better guidance for prospective students. This entry was posted in Admin, HE, Management, Students, teaching and learning, University and tagged Administration, admissions, HE, KIS, NSS, Students, teaching and learning, Unistats, universities, Which? by Paul. Bookmark the permalink. An additional potential eventuality is that students lose trust or get lost in the data and take to social media outlets such as ratemyprofessor.com in the US. In this moment of data saturation should HEI’s worry about the reputations of their academics? How important is the reputation of the institution in a league table obsessed HE culture? I would venture that protecting academics and the reputation of the institution makes strong quality enhancement at course level even more important. As you say it’s not about more data – rather it’s how HEI’s utilise data internally to cultivate the trust of the students and protect the reputation of the academics and the institution itself. Thanks for the comment and really good point – we have to use this data ourselves too. The problem with stats like these is that, if Unistats does become well used by applicants for deciding where they’ll go, institutions will just optimise for these particular stats. And the ways in which they do this may not always be best for the learners. Also, where’s the info about prices of beer and proximity of pubs? That’s what I wanted to know when I was looking at universities. Thanks for this – good point. There is always a danger with this kind of data that it creates perverse incentives for universities to chase improvements in the published stats rather than what actually matters in terms of good teaching and learning.